Thomas E. Brennan was born in Detroit, Michigan, on May 27, 1929. He was graduated from Catholic Central High School in Detroit, where he excelled in forensics, and continued his education at the University of Detroit. In 1951, he married Pauline M. Weinberger. In 1952, he completed his law studies at University of Detroit, earning an LL.B. Brennan began his law practice in Detroit in 1953, working with the firm of Waldron, Brennan, Brennan, and Maher until 1961. In that same year, he was elected to a seat on the Common Pleas Bench. In 1963, he was appointed by Governor George Romney to the Wayne County Circuit Bench, and in 1964 he was elected to that same position. In 1966, Governor Romney again called upon Brennan, this time to seek the nomination of the Republican Party as Associate Justice of the Michigan Supreme Court. Brennan won the nomination and the election in a stunning, inadvisable, underfinanced, and unpredicted victory. 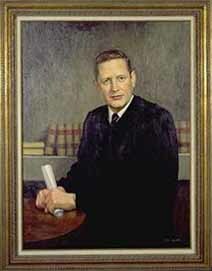 During the years 1969 and 1970, Brennan served as Chief Justice; he was the youngest justice to serve in that capacity. During his service on the Bench, Brennan received many requests for law school recommendations. He soon saw the need for a law school in Lansing. Providing legal education became his passion, and in 1972, he incorporated the Thomas M. Cooley Law School. Although reluctant to leave the Court, Brennan decided to devote his professional career to the newly formed law school, and on December 6, 1973, made his farewell address to the Court.